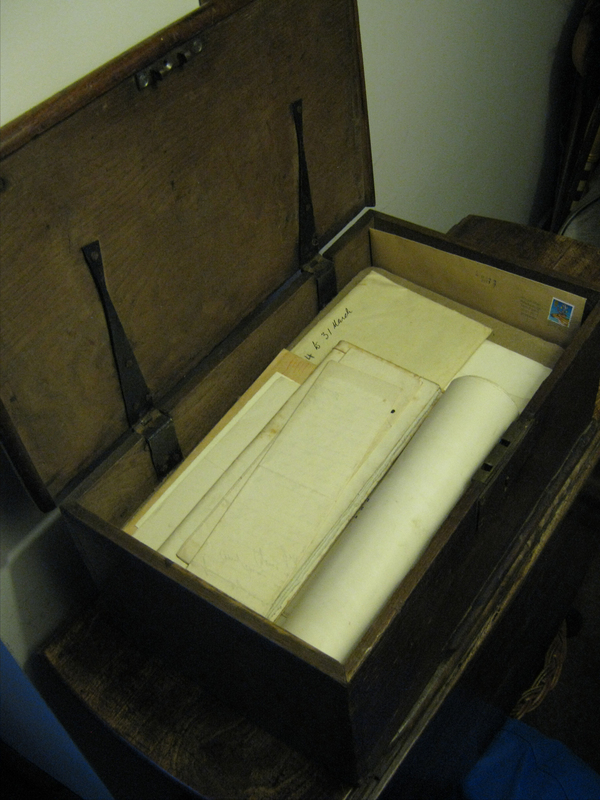 This is one in a series of blog post about some old papers of the WALKER family, from Kirkliston, West Lothian, Scotland. You can see a list of the papers that have been posted onto AFamilyHistoryBlog HERE. 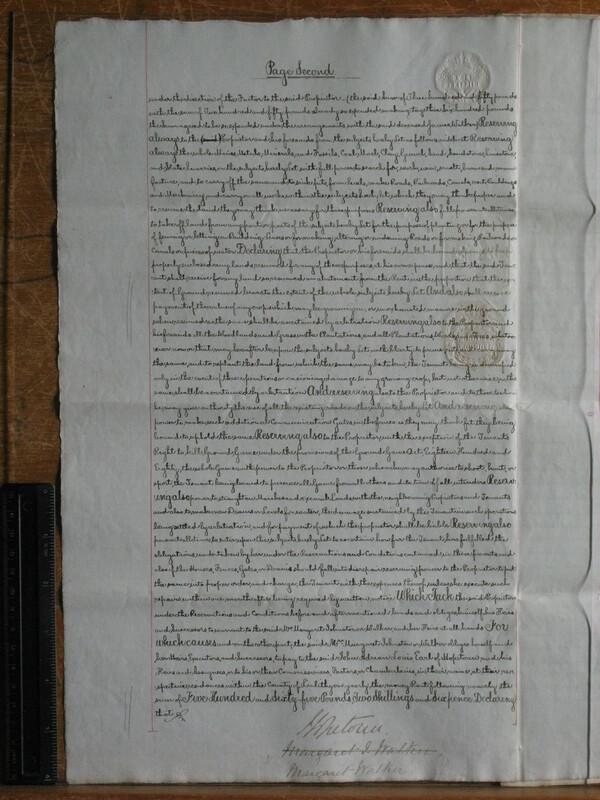 This document is a lease agreement (or “Tack”), dated 12th and 13th May 1884, made between the Earl of Hopetoun, John Adrian Louis Hope (landlord), and my paternal Gt-Gt-Grandmother, Margaret Johnston (or Walker) (tenant), for the farm at Kilpunt, Kirkliston, Mid Lothian, following the death of Margaret’s husband, James Walker, in 1881. James Walker and Margaret Johnston (both born in 1818) had married at Bathgate, West Lothian, in February 1847. James had lived at Kilpunt from at least that date (if not earlier!). The Walker family appears to have been farming the land at Kilpunt since earlier in the 1800’s, having combined it with the neighbouring farm of Hiddlefaulds, where they had lived since 1745. 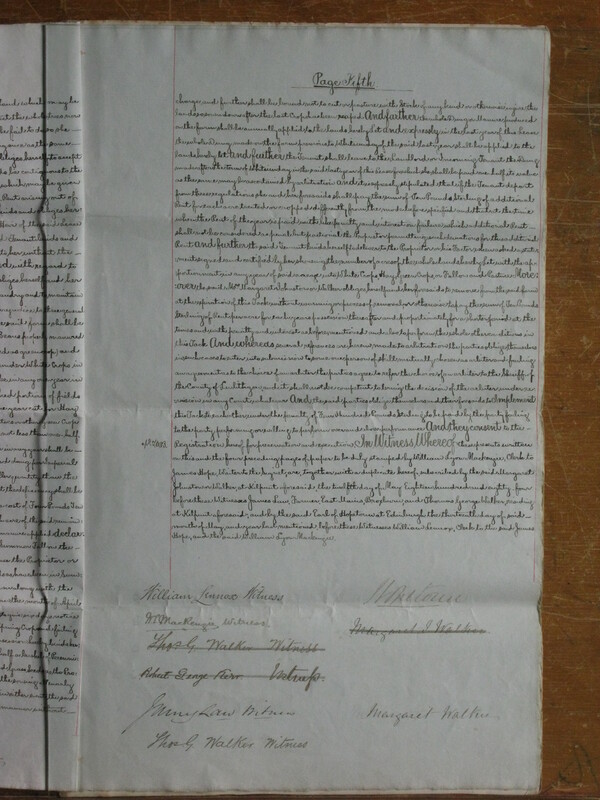 No doubt, after James Walker’s death, much of the day-to-day farm work would have been done by his son (my Gt-Grandfather), Thomas George Walker, who is a signed witness to the lease, and who inherited the lease when Margaret died in 1890. 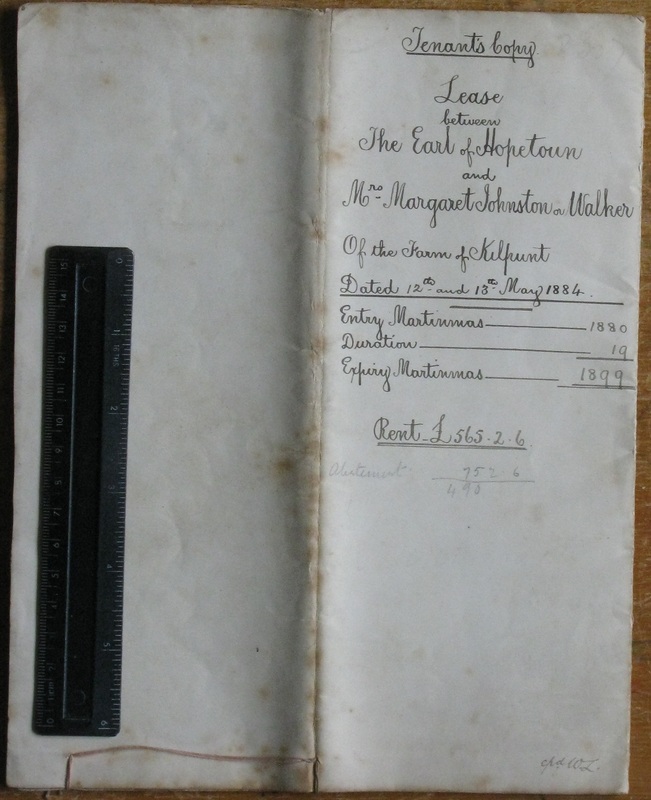 Recently, while I was transcribing this document, I came across a document on-line, dated 1888 (so within the duration of this lease), where the Earl of Hopetoun leased land at Kilpunt for a railway line. This puts into context the need in this agreement for clauses about roads, railways, canals, etc. See that pdf document HERE. Note the map on page 6 of that PDF file. The route of the railway runs right through the site of Hiddlefaulds farm, where the Walker family had lived for around 100 years before moving into Kilpunt farmhouse in the 1840’s. The 25 inch Ordnance Survey maps available through the National Libruary of Scotland, show Hiddlefaulds on a map surveyed in 1893, but the railway in its place on a revised map of 1895. Please click on the images below to view at full resolution. 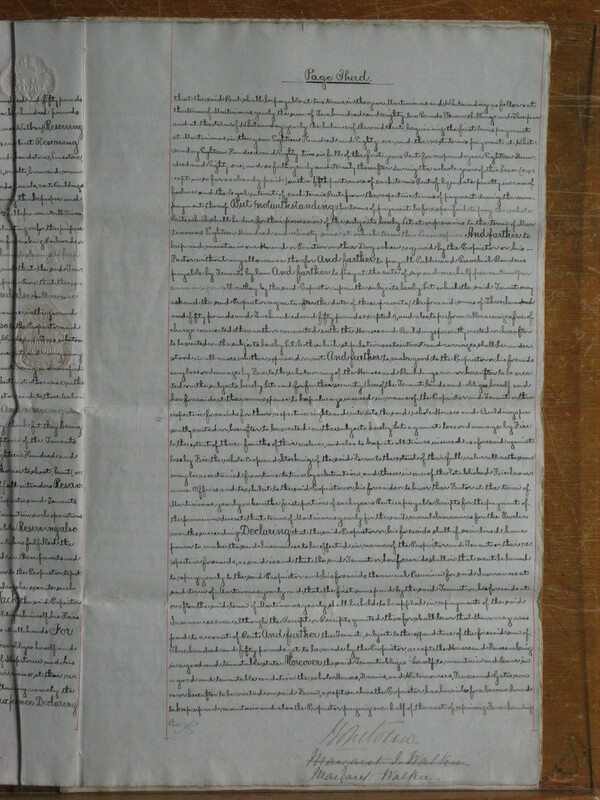 Transcribed text appears in a Maroon colour below each image. At the bottom I’ve made some notes about the document. charge, and further shall be bound not to cut or pasture with stock of any kind or otherwise injure the lands so sown down after the last Crop has been reaped. And further the whole Dung or Manure produced on the farm shall be annually applied to the lands hereby Let and expressly in the last year of this Lease the whole Dung made on the farm previous to Whitsunday of the said last year shall be applied to the lands hereby let. And further the Tenant shall leave to the Landlord or Incoming Tenant the Dung made after the term of Whitsunday in the said last year of this Lease for which she shall be paid one-half its value as the same may be ascertained by arbitration. And it is expressly stipulated that if the Tenant depart from these regulations she and her foresaids shall pay the sum of Ten Pounds Sterling of additional Rent for each acre treated or cropped differently from the mode before specified and that at the time when the Rent of the year is paid with like penalty and interest on failure which additional Rent – shall not be considered as penal but pactional the Proprietor permitting such deviations for this additional Rent. And further the said Tenant binds herself to deliver to the Proprietor or his Factor when asked a statement signed and certified by her showing the number of acres of the whole lands hereby Let with the apportionment in any year of said acreage into White Crops, Hay, Green Crops, or Fallow and Pasture. 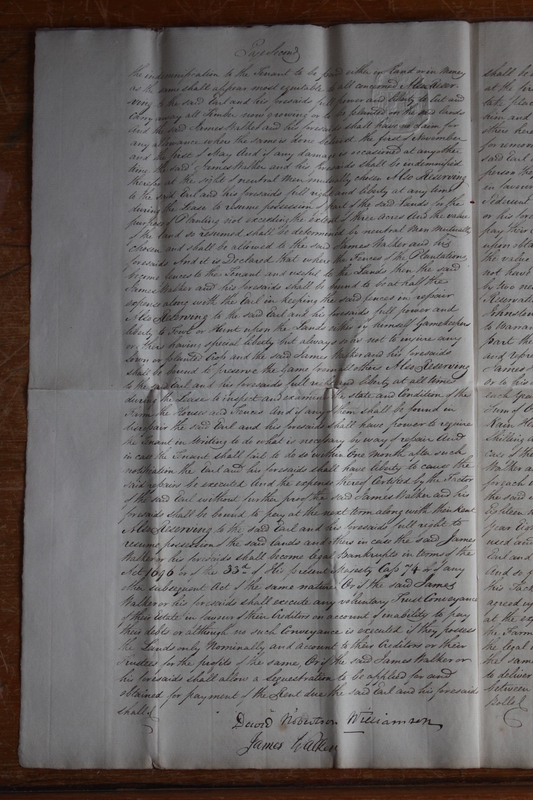 Moreover the said Mrs Margaret Johnston or Walker obliges herself and her foresaids to remove from the said farm at the expiration of this Tack without warning or process of removal, or otherwise to pay the sum of Ten Pounds Sterling of Rent per acre for each years possession thereafter and proportionately for a shorter period at the times and with penalty and interest as before mentioned and also to perform the whole other conditions in this Tack. And whereas several references are herein made to arbitration the parties oblige themselves in such cases to enter into submission to some one person of skill mutually chosen as arbiter and failing an agreement as to the choice of an arbiter the parties agree to refer the choice of an arbiter to the Sheriff of the County of Linlithgow, and it shall not be competent to bring the decision of the arbiter under revision in any Court whatever. And the said parties oblige themselves and their foresaids to Implement this Tack to each other under the penalty of Four Hundred Pounds Sterling to be paid by the party failing to the party performing or willing to perform over and above performance. And they consent to the – Registration hereof for preservation and execution. 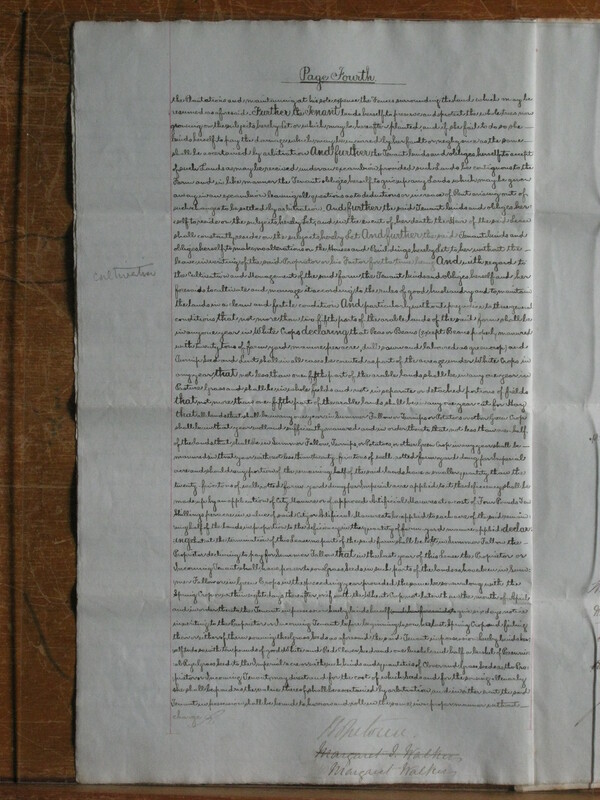 In Witness Whereof these presents written on this and the four preceding pages of paper to be duly stamped by William Lyon Mackenzie, Clerk to James Hope, Writer to the Signet, are, together with a duplicate hereof subscribed by the said Margaret Johnston or Walker, at Kilpunt aforesaid, the twelth day of May Eighteen hundred and eighty-four before these witnesses; James Law, Farmer, East Mains, Broxburn, and Thomas George Walker, residing at Kilpunt aforesaid; and by the said Earl of Hopetoun at Edinburgh the thirteenth day of said – month of May, and year last mentioned, before these Witnesses; William Lennox, Clerk to the said James Hope, and the said William Lyon Mackenzie. John Adrian Louis Hope was the 7th Earl of Hopetoun, and 1st Marquess of Linlithgow. “Act of Sederunt”; in Scots law – see Wikipedia. “allenarly”; meaning “solely”, or “only” – see Wiktionary. “excamb”/”excambion”; in Scots law, excambion is the exchange of land – see Wikipedia. “Factor”; a property manager or estate manager – see Wikipedia. “videlicet”; meaning “namely”, “that is to say”, or “as follows” – see Wikipedia. Margaret JOHNSTON, b. btw. 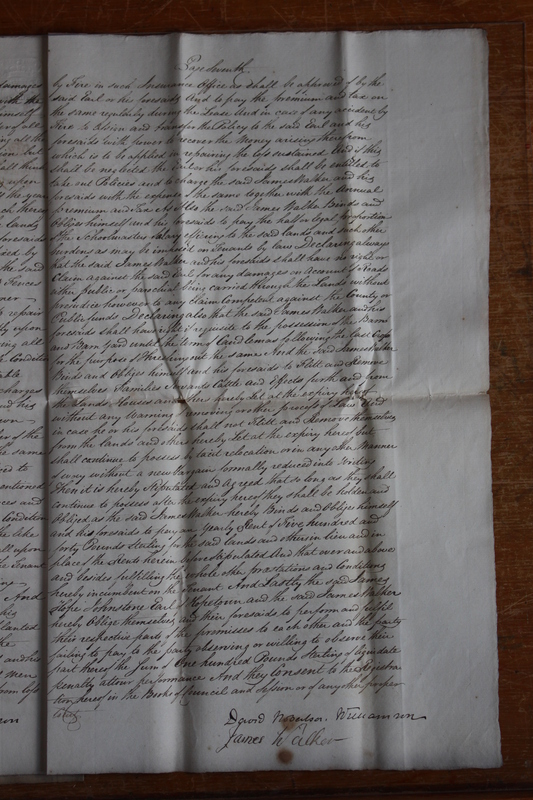 Apr & Sept 1818, daughter of John Johnston & Margaret Young. d. 15/09/1890 (see the JOHNSTON family tree HERE). John Johnston WALKER, b. 21/01/1848, d. 19/11/1891, in New Zealand (no issue). Margaret Young WALKER, b. 19/10/1849 (twin), d. 13/5/1891 (no issue). James WALKER, b. 19/10/1849 (twin), d. 4/5/1851 (at 18 months). Isabella Neil WALKER, b. 03/05/1852, d. 08/11/1916, m. 07/06/1894 – Thomas ALLAN (no issue). Jemima Janet WALKER, b. 30 Mar 1854, d. 24/12/1892 (no issue). Mary WALKER, b. 09/02/1856, d. 25/6/1903, m. John BRASH (1 daughter). Elizabeth Barron WALKER, b. 07/10/1860, d. 14/10/1882 (no issue). 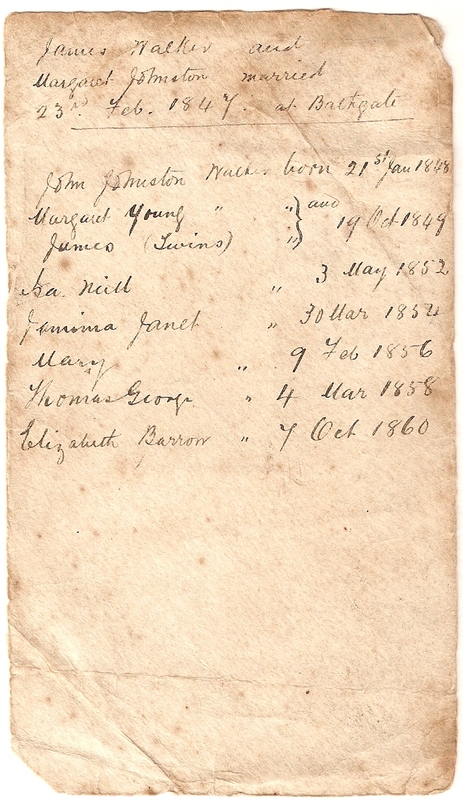 A back of an envelope note of date of James Walker & Margaret Johnston’s wedding, and DoB of their children, written (I suspect) by their son – Thomas George Walker. For futher details see A history of the WALKER family. 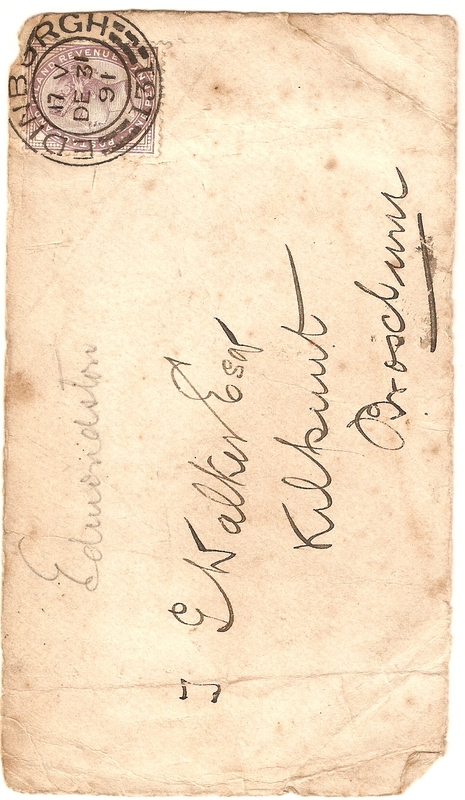 Front of the envelope, addressed to Thomas George Walker, at Kilpunt. Postmarked 31st December 1891. This is one in a series of blog post about some old papers of the WALKER family, from Kirkliston, West Lothian, Scotland. Please see a list of these papers HERE. 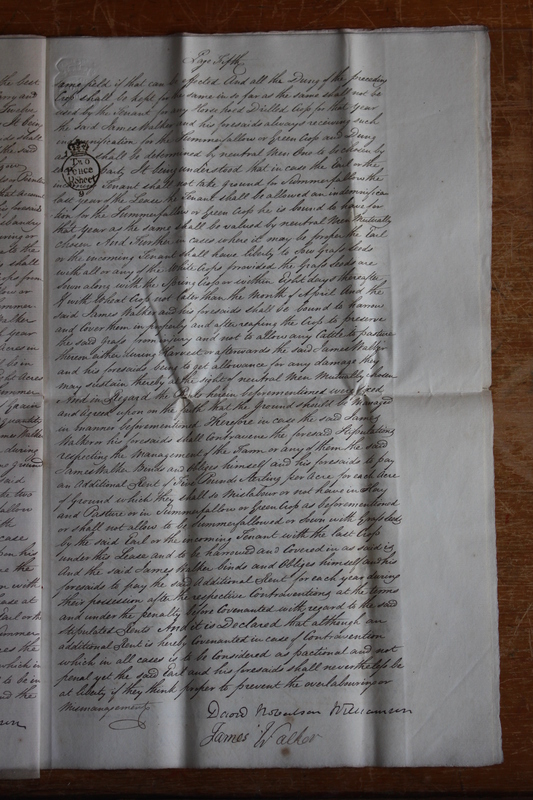 This document is a lease agreement (or “Tack”) made in 1813 between the Earl of Hopetoun, James Hope Johnstone (landlord), and my paternal ancestor, James Walker (tenant). 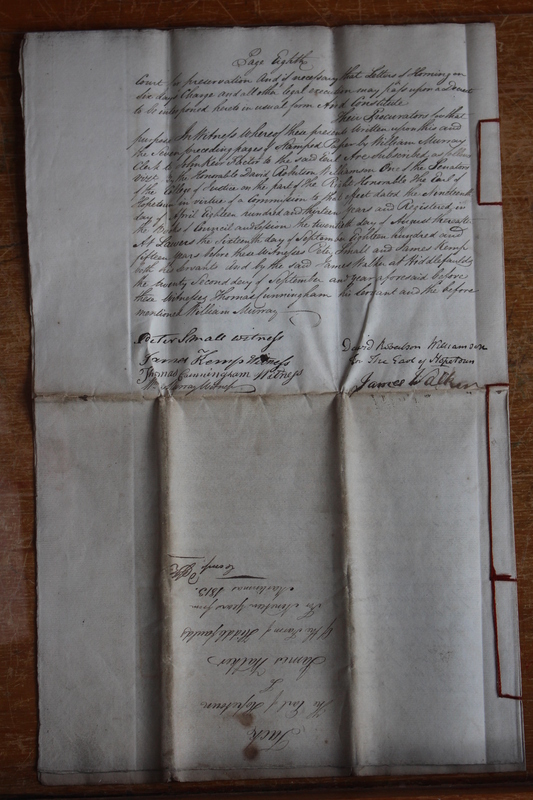 James Walker was born in Kirkliston, in August 1731 – so would be about 82 years old at the time that this lease was agreed. 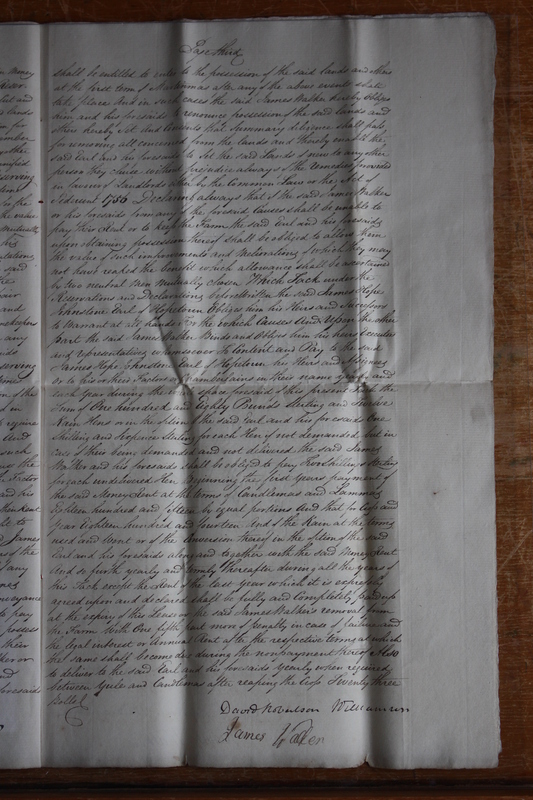 So it is likely that his son, John Walker (b. Jan. 1772) was running most of the day-to-day work on the farm by this time! 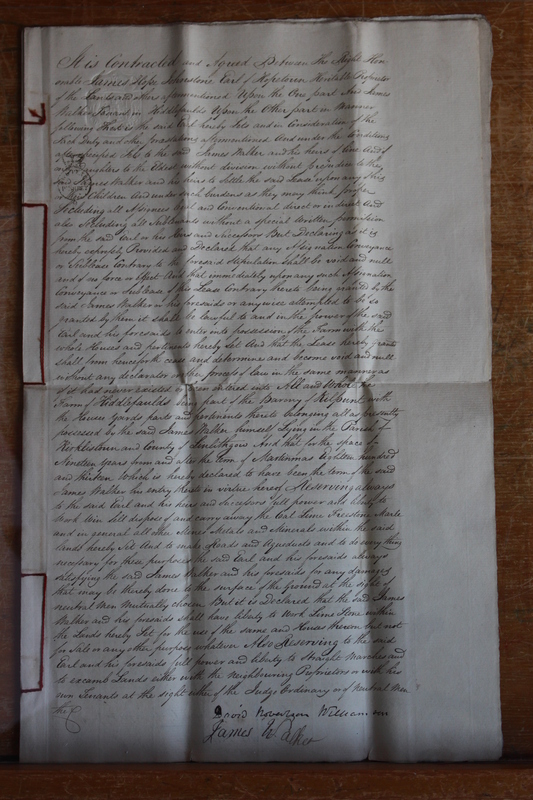 For an earlier (and much simpler) lease of Hiddlefaulds, agreed with James Walker in 1775, see HERE. James Walker, and his wife, Janet Flint, both died in 1817 and are buried in Kirkliston churchyard. 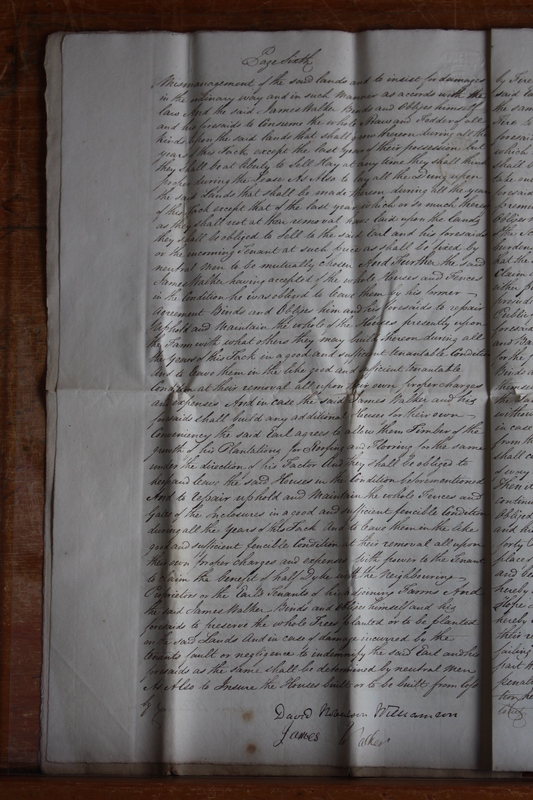 Their son, John Walker, is recorded in the Kirkliston parish registers as having “irregularly” married Isabel Neil, in May 1816, with their first daughter being born in August of that year! At some point (it appears during John Walker’s time) the family also took on the tenancy of the neighbouring farm at Kilpunt. 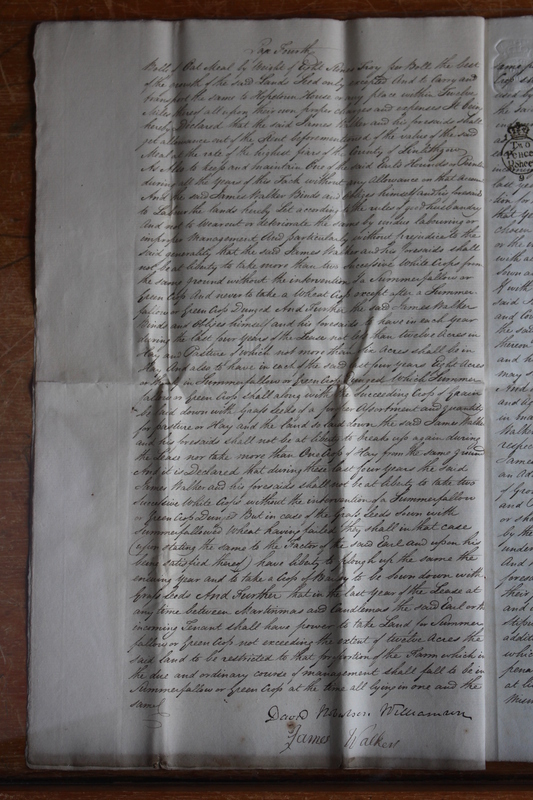 Due to the nature/condition/size of this document, I have photographed, rather than scanned, most of the pages. Please click on the images to see the scans at full resolution. 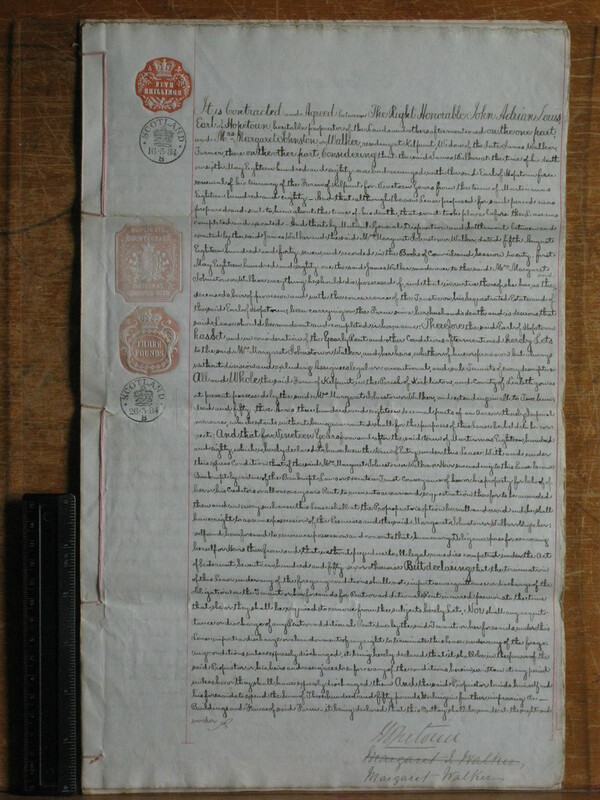 Transcribed text appears in a Maroon colour below each scanned image. At the bottom I’ve made some notes about the document.